Did you know that I moderate a private Facebook group for doll and toy designers? It’s The While She Naps Softie Designers Forum and we have over 200 members. I love this group so much. It’s a place to ask questions, get new ideas, and support fellow makers. 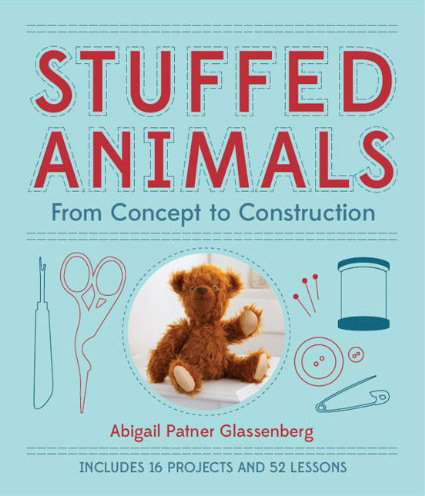 If you design sewing patterns for softies you’re welcome to join us. Request a membership here. It’s very simple. Just a front and back. Not intimidating at all. There’s lots of room for embellishment. We’ve already got several group members doing free-motion embroidery on the body of the Peanut Baby. I’m adding pigtails to mine. Applique? Patchwork? You name it. Get creative. It’s also very clever. The hair on the back of the head flips back and forth to reveal either an awake face or a sleeping face. 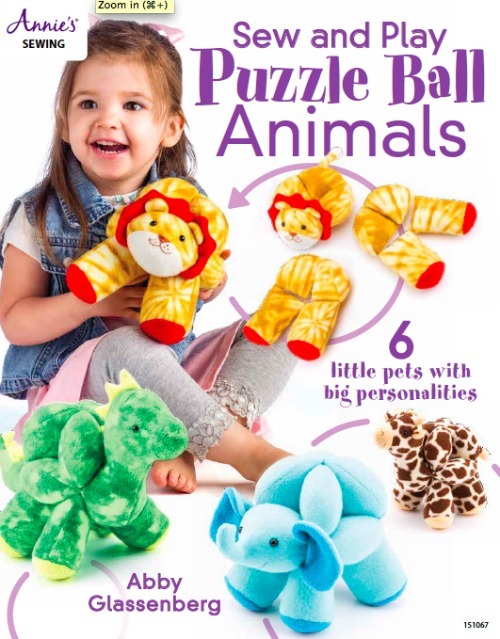 I love reversible toys and flip toys because they’re totally fun to play with. 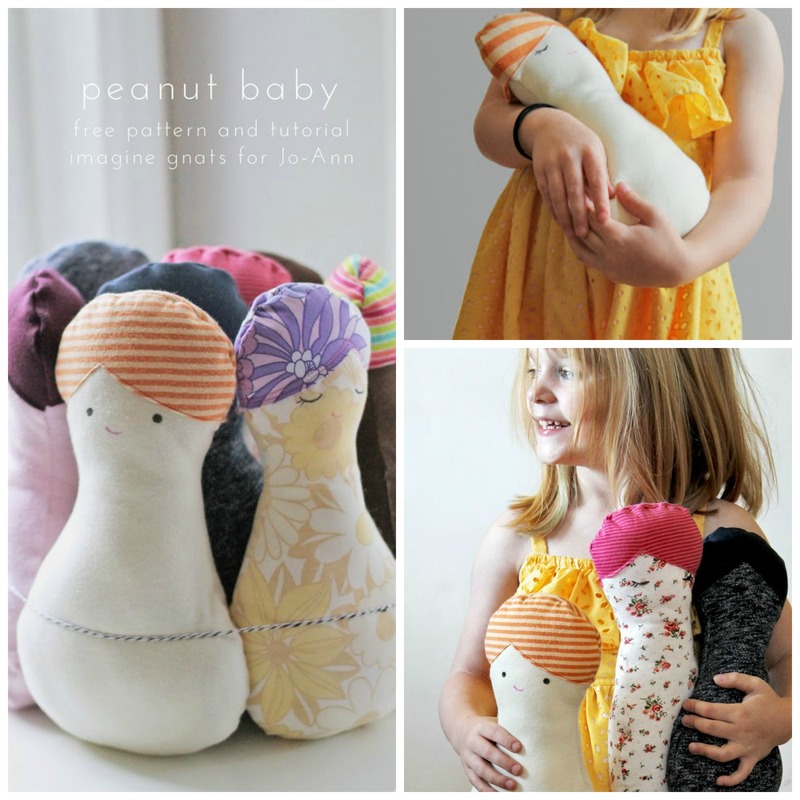 Peanut Babies are so quick to sew that you might find yourself with some extras. If you do, the members of the Softie Designers Forum suggest donating some to a local charity. Want to join us? I hope so! Take a picture of the Peanut Babies you sew and post it to my Facebook page before July 18. I’ll choose a winner and send you two patterns of your choice from my shop as a prize. Yay! Speaking of Joann’s, I was there on Friday and pulled this out of the drawer. 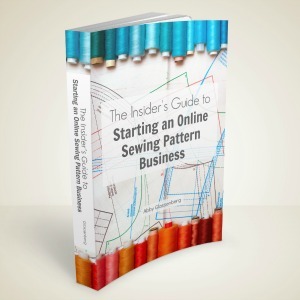 I’m especially proud of this pattern because Simplicity bought my photo to use as the cover art. How cool is that! The woman working at the checkout counter said, “Oh, how cute!” when she rang it up (Yes, I have to buy my own patterns.) I told her I designed it and pointed out my name on the cover. She said, “Did you win a contest or something?” Nope. Designing cute patterns is my job and it’s a pretty great one at that. I originally posted this photo on Instagram. I’m liking Instagram more and more and posting pretty much every day. Are you there? Let’s connect. 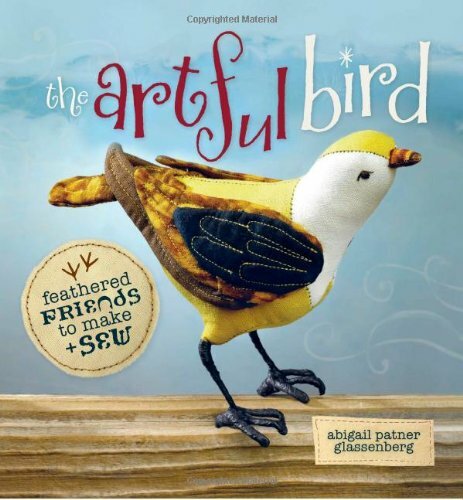 I’m teaming up with my friend (and social media expert) Meighan O’Toole to teach a workshop next Friday night at JP Knit & Stitch. 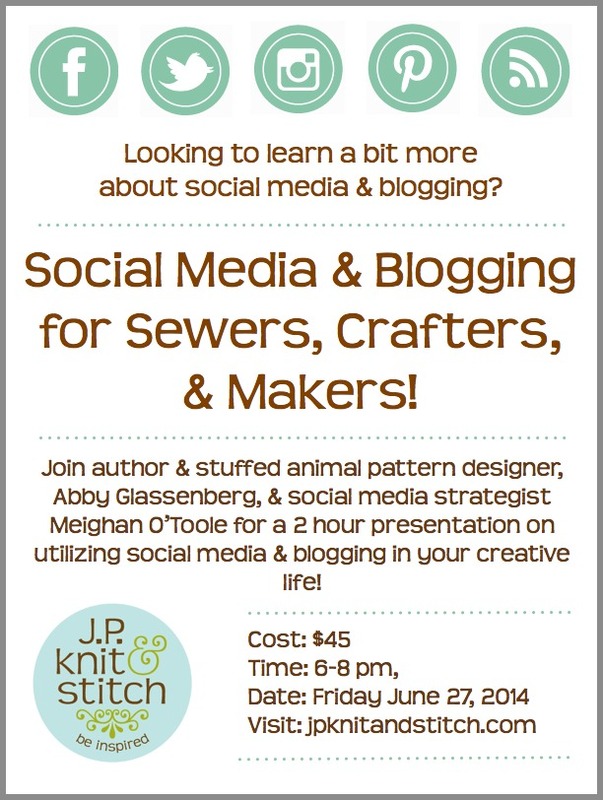 The class is called Social Media & Blogging for Sewers, Crafters, & Makers and I’m pretty excited about it. For my part of the presentation I’ll be tracing the history of While She Naps, explaining how it’s changed over time and what kinds of opportunities it’s led to. 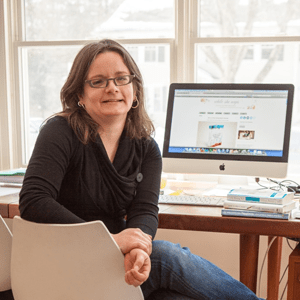 I’ll also show you how to make a blog the hub of a successful creative business and how to use social media to build community and an audience for your work. The class is from 6pm-8pm on Friday, June 27. Register here. 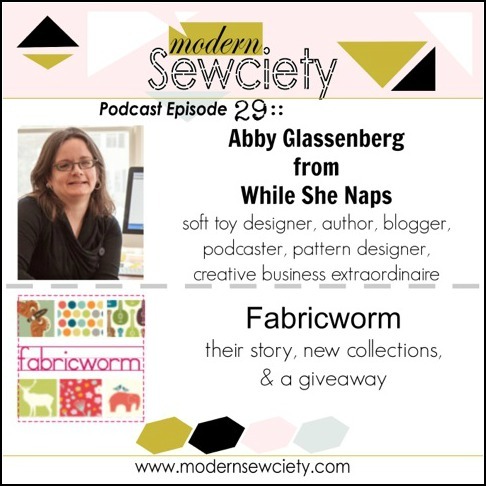 Late last week I was a guest on Modern Sewciety, a podcast for people who love to sew. Stephanie and I had a really nice chat. You can tune in here (my interview begins at minute 29). Whew! It’s been busier than I thought. Just one more thing…Tune in on Monday for a very special episode of the While She Naps podcast. I’ll be talking to Ann Wood. The pattern looks great! Congrats! I just started on Instagram too and I’m beginning to see the potential for reaching that “visual/artist” audience that might not use twitter. Plus you can reach the twitter folks with just one extra click! Yes, that’s totally true. I’m getting more and more into Instagram. I like the little behind-the-scenes glimpses into people’s daily working lives. It’s really a great group. It’s one of the best things I’ve done all year. I’m excited to sew my Peanut Baby! Yay! Great idea. Thanks, Stephanie! 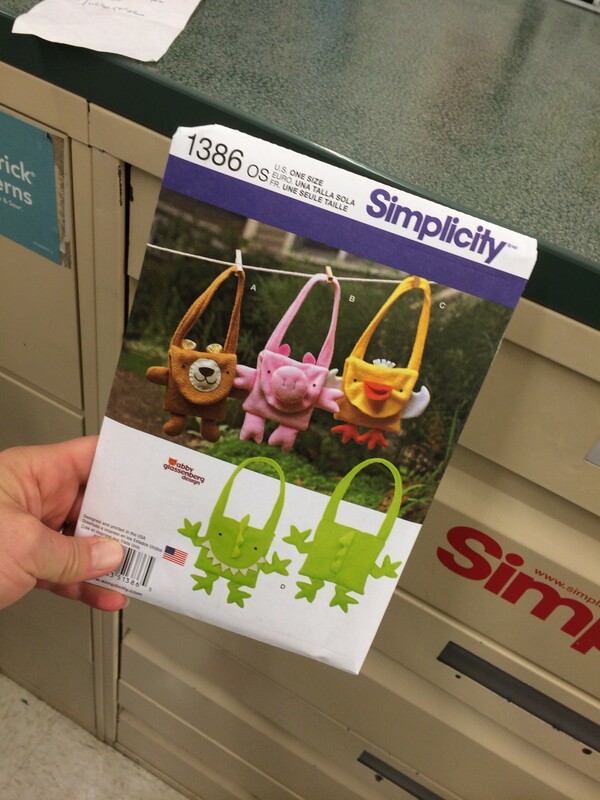 Congratulations on the Simplicity pattern! It must feel great! The peanut baby is so adorable and I do have some gifts to make for little ones, so I think I will be making one or two of these! Thank you so much. I think the only class I’m teaching over the summer is a Get To Know your Sewing Machine class. I’m figuring that’s way too basic for you, though. I’ll definitely let you know if any other events or classes come up!